ETD was approached by a European based company to rent their Electrical Discharge Sampling Equipment (EDSE) for a month to cut samples from a power plant in Asia. The EDSE was developed by ETD in collaboration with international partners to aid in the condition and life assessment of components. The sampling of in-service components has long been seen as an effective way of determining actual material properties and sub-surface material condition. 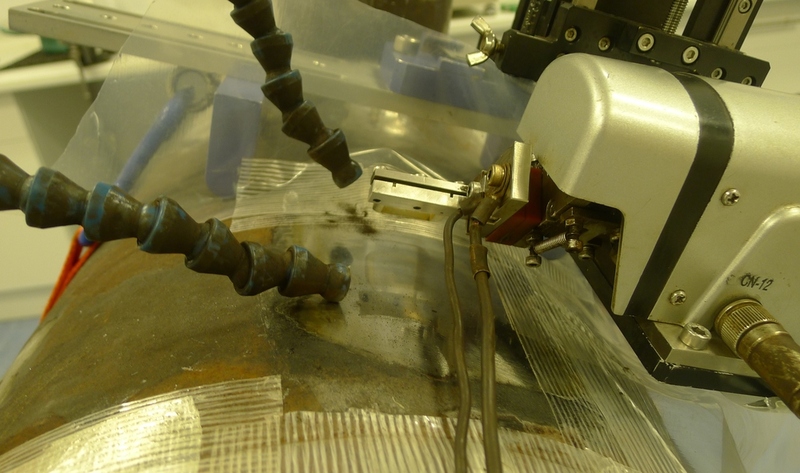 However, many of the existing methods of sample removal require mechanical cutting which can deform the surface and usually require weld repair. Unlike the traditional mechanical ‘boat sampler’, with EDSE, the surface damage if any is of the level of only a few microns. 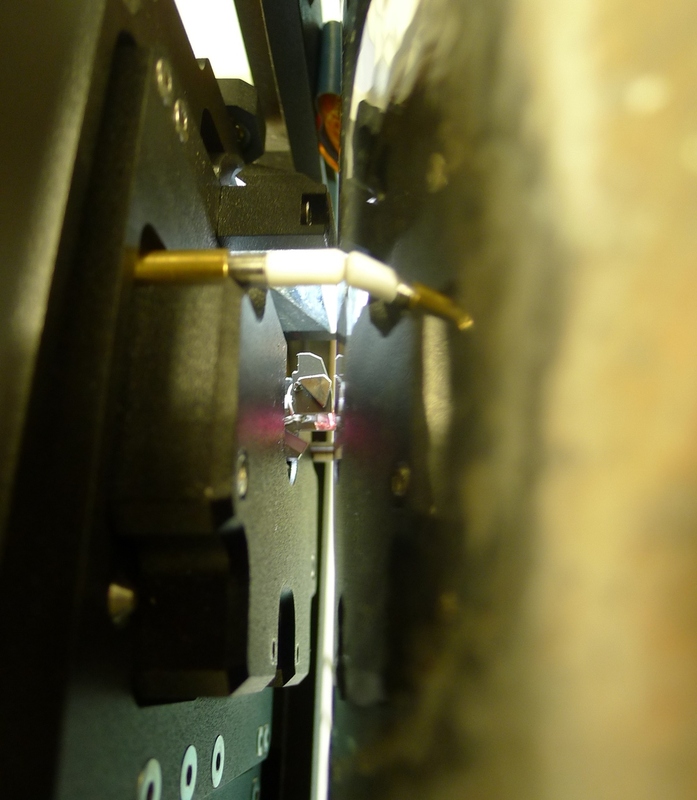 EDSE can also be used to cut out specimens for small punch testing and miniature creep, fatigue or tensile testing for more accurate quantitative life assessment. The EDSE is available to rent or for purchase. For more information on our EDSE services, please click here. A European based company approached ETD to submit a proposal on cutting samples of very small thickness (1mm or less) from pieces of a ring segment and a combustor basket. The work on the ring segment and combustor basket supplied to ETD by the client was carried out at the ETD site by one of our engineers. One sample was cut from the ring segment and one from the combustor basket. This is to understand the interface between the coating and the substrate. Before cutting out the specimen from the combustor basket the area around the piece to be cut out was cleaned of the ceramic coating and then a thin piece cut out by our EDSE. Photos and videos were made of the cutting process and all samples sent back to the client. For more information on our EDSE services, please click here. ETD is pleased to announce the successful recent completion of a Creep Assessment project. The principal objective of this study was to examine components in order to detect the presence of any creep cavities. The components are manufactured in P11 steel. In order to perform this study ETD suggested using standard replication technique and its most advanced equipment Scanning Force Microscope (SFM) and (EDSE). Firstly, operation details such as temperature, pressure and service hours were checked in advance in order to have a general understanding of the condition of the components. Component drawings were then checked to organize inspection with the SFM and to identify replica spots and EDSE sampling locations. Secondly, Component inspection was performed with the SFM microscope. The number of scans depended on the number of areas identified for inspection on each component. Replication was then performed after SFM scanning is completed. The replication was carried out at the same location where SFM scan was carried out. The number of replicas depended on the number of areas identified for examination and time available at the plant. Next, The EDSE was used to cut out two to three specimens (depending on the accessibility of the location) of the dimensions. These were studied later in the laboratory to counter check the damage detected by the SFM and replication. For such a comparison it will be necessary to study these samples both under the Optical and Scanning Electron Microscopes. Lastly, a report was submitted covering results of investigations and recommendations for any further actions to be taken. For more information on our On-Site Services, please click here. If you have an upcoming outage in 2017 or beyond, ETD Consulting - a UK based company operating globally, would like to offer a quote for your outage work. We can make technically excellent and cost-effective proposals for your on-site NDE services and/ or post-outage life assessment. 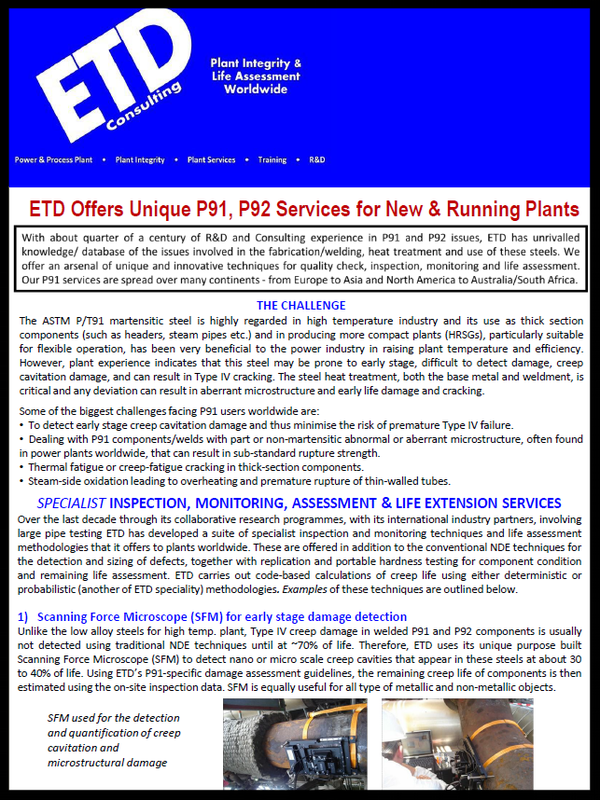 The advantage of ETD over many others is that ETD can conduct both on-site services and post-outage life assessment. We are also independent so can provide you impartial services. Our expertise in plant integrity/ life assessment, Condition Assessment, FFS, RBI etc. is well established and is backed up by state-of-the-art technologies developed in collaboration with the international industry – technologies that are the envy of our competitors. Our long established expertise means that, when we review your plant’s historical operations and maintenance data, we know what to look for and what needs to be inspected and tested during the outage. We can therefore direct and co-ordinate our testing and inspection teams to undertake the most appropriate tests in the right spots, ensuring the most productive use of your outage time, to gather the most useful testing data and samples for analysis. We can then, if required, analyse the data and samples and provide you with life assessment reporting and forward thinking operations and maintenance recommendations, or even develop maintenance plans for you, as you require. Whether your need is for one-off replication services, other NDE on-site services and/or life assessment - or if you want one organisation to design, manage and run your entire outage and life assessment process, ETD can assist. We know that many organisations require supplier pre-approval and we are happy to undertake such registrations if needed. If you would be interested in discussing potential projects further please feel free to contact us. ETD is pleased to announce the successful recent sale of one of our Electrical Discharge Sampling Equipment (EDSE). This is a unique tool for NDT sample cutting, developed together with one of our international partners. EDSE is one of a groundbreaking range of NDT and engineering consultancy services offered by ETD. It cuts out small slices between 1 to 20 mm thick and approximately 20mm square or 40mm square or 40mm x 120mm from thick section components for their remaining life evaluation and extension. The unique cutting process leaves behind cavities with round edges that do not require repair. The cutting time for a standard specimen is about 1.5 hours and the EDSE can be used on horizontal, vertical and angled surfaces by either strapping to the component or through the use of a magnetic mount. It has been used both on pressure vessels and turbine rotors but can also be used on any industrial structures such as windmills, bridges etc. The purchase came from a Czech Republic based company. They focus on improving in service reliability and service life of power engineering devices – material tests, residual service life assessment, etc. The EDSE is available for purchase or rental or for use as part of ETD’s services. For more information on the Electrical Discharge Sampling Equipment click here. ETD are pleased to announce the successful recent completion of an NDT project using our Electrical Discharge Sampling Equipment (EDSE). EDSE is a unique tool for NDT sample cutting, developed through R&D work involving ETD and one of our international partners. Its spark erosion cutting technique leaves behind no stress concentrations and rounded edges that do not require repair. EDSE is one of a groundbreaking range of NDT and engineering consultancy services offered by ETD. In the most recent project, the EDSE was used successfully to remove two axial samples from the interstage gland area of a Steam Turbine (ST) rotor, where 2 off ‘boat samples’ were taken on the LP rotor between the stage 3 and 4 rotor discs. ETD mounted the EDSE cutting head in the confined space between the rotor discs using a magnetic mounting system and bespoke frame. The rotor itself was from a double-flow Low Pressure (LP) type ST with 5 stages. The boat samples taken both measured 12mm in depth (thickness), 20mm width and were approx. 80mm in length. The material of interest was removed, since it contained small surface defects which had been detected by NDT – in need of root cause analysis to pin point the cause of material degradation. Following this work, the rotor is to be machined in order to dress-out and remove the excavation sites (by diametric reduction of the interstage gland area) as part of the component refurbishment cycle, before the expected return to service of the rotor. The EDSE is available for purchase or rental, or for use as part of ETD’s services . ETD Consulting has developed SFM and EDSE as part of its R&D work with international partners. The technologies are available, either for sale or for use as part of our on-site services. 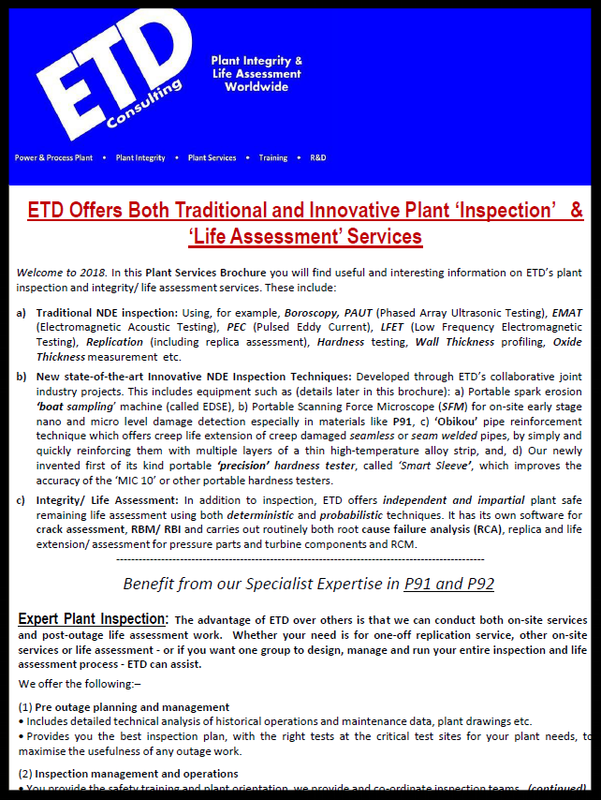 Thus, if you engage ETD Consulting for your inspection and analysis needs, you can be sure that you will benefit from the most advanced detection and sampling technologies in the field. To read the Combined Cycle Journal article please click here. To read more about these products please click here.